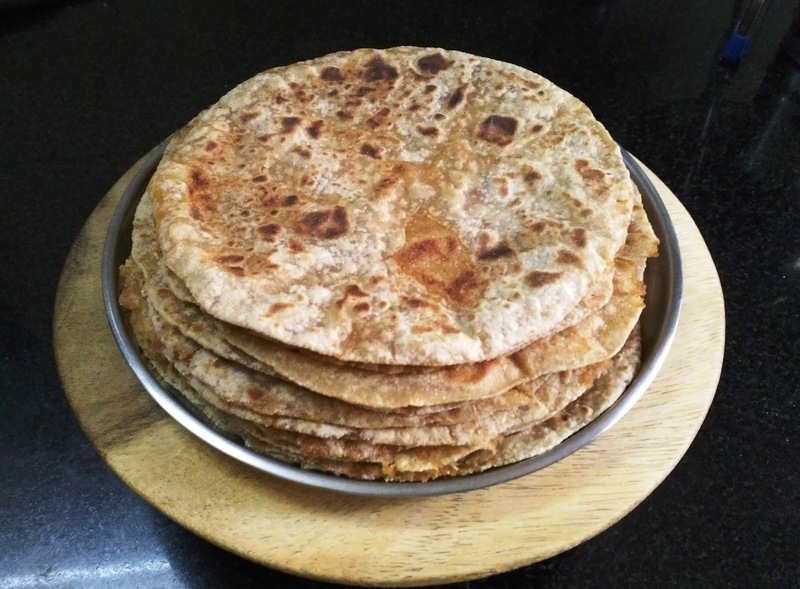 Easy & quick way to prepare sanja poli !! This recipe never goes wrong if you follow exact measurements !! 1. In a heavy bottom pan add water. Turn on the gas on high flame. 2. 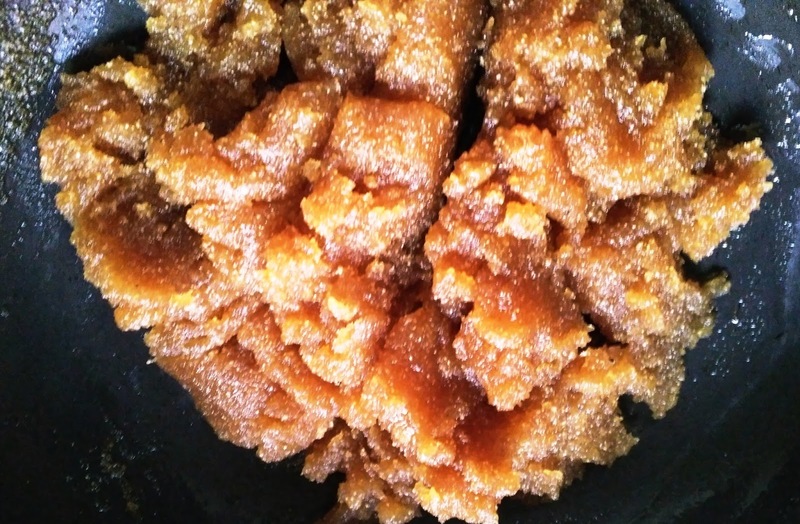 Add jaggery in the water when water starts boiling. 3. Stir the mixture till all the jaggery melts. Add desi ghee & elaychi or jayphal powder. 4. Mean while roast the suji for 5 minutes. Roasting till suji turns brown is not required. 5. Add suji in the jaggery & water mixture. Mix properly. Cover the pan & keep on low flame till sanja becomes dry. Turn off the flame. Mix all the ingredients & prepare a smooth dough like chapati dough. Only more oil is required for this dough for soft sanja roties. 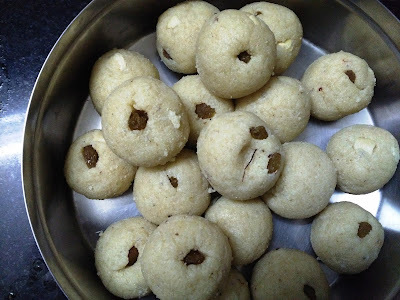 Take a small ball of ata & same amount of sanja & stuff it by preparing a cup of ata or simply roll ata ball in puri size & stuff sanja in it. Now roll the roti or poli as much as you can. Roast on non stick griddle till it becomes golden brown. Sanja poli is very easy to roll. 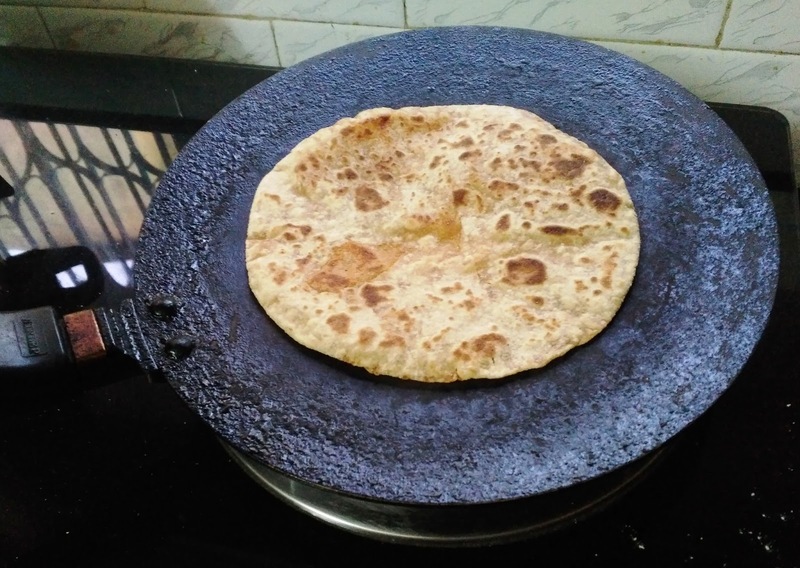 You can prepare 15 rotis out of it in just 1/2 an hour. Enjoy this delicious Sanja poli with ghee or milk. It is very convenient to carry these rotis while travelling. It lasts about 4-5 days. 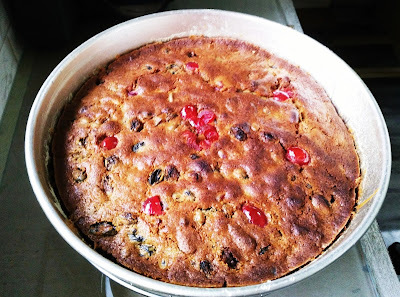 Moist & soft easy egg less & alcohol free Christmas cake!! 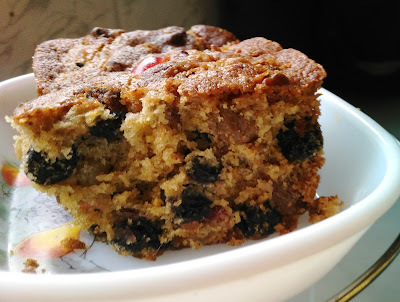 In a bowl take black raisins,golden raisins, walnuts, cashews, glazed cherries & tuty fruity. Any other dry fruits like apricot can be used. Add orange juice in the fruits & soak for 3-4 hours or if you have time then soak overnight. Before starting to prepare cake drain the soaked fruits & keep aside. 1. Sieve maida, baking powder & baking soda in a bowl. Keep aside. 2. In another bowl take soften butter & brown sugar. Mix well with hand whisker till it becomes fluffy. Add yoghurt , hot milk & vanilla essence. Add cardamom powder, cinnamon & clove powder. Again mix well. Mixture looks curdled. But does not matter. 3. Add maida mixture slowly & fold gently. Add orange & lemon zest. 4. Add soaked fruits, mix well. Add also orange juice after draining fruits. 5. Pour the batter in a greased mould & bake in preheated oven at 180 C for 30-35 minutes. Enjoy this moist & soft cake which requires very less soaking time. Add milk, fresh cream, coconut & sugar in a heavy bottom pan. Keep the the pan on gas stove & turn on the flame. Keep on medium heat. Add rawa in another pan & roast nicely without changing its colour.. When milk mixture starts boiling keep it on low flame for 5 minutes. Add roasted rawa while it is hot in this milk mixture. Add desi ghee. Mix properly & turn off the flame. Add dry fruits , elaichi powder & saffron threads. Roll the laddus as per size you want & enjoy ! !